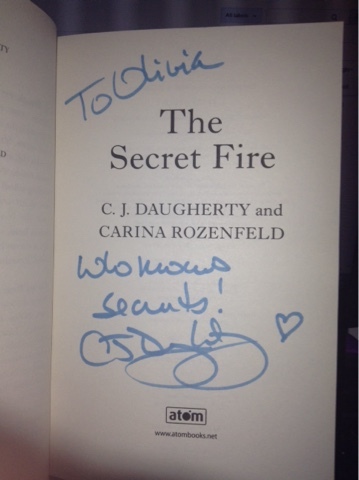 On Monday I went to a C.J.Daughtery book talk and signing. She was really good, I now want to be a crime journalist. She told us about how she became a novelist and her work as a journalist. She came to promote her new duology 'The Alchemist Chronicles'. I have never read her 'Night School' but loads of my friends are obsessed with it and when I read the synopsis for 'The Secret Fire' I knew I had to go. She didn't let me down. I had to hug my friend through the first 5 minutes because she was crying because C.J. Daughtery was in the same room as her. I was enthralled the whole time she was talking. She really knows how to keep an audience captivated. I hope it translates into her books. After the talk she did a book signing and luckily I was one of the first people in the queue. She was really nice and even gave me the title of the next/final book in her new series for me to put on Lovelaces. So I'm the first person to put this on the internet. She did a personalised note to everyone and mine reads says 'who knows secrets' obviously referring to me knowing the title of her next book. I'm so glad I went to see her and if you ever get the chance to see her speak you should definitely go. Maybe she'll come back when she is promoting her next book 'The Secret City'! !